Look! There on the TV! It’s a Perd! It’s redundancy! It’s Perd Hapley! Supergirl is a new show about a young woman, Kara Danvers, an illegal alien, who is coming into her own. Once a bumbling assistant who couldn’t even get a hot coffee right, now she’s gaining confidence by punching aliens until they lose consciousness! But the public wants to know more about Supergirl, to whom will they turn as a trustworthy source? Disclaimer: This blog post contains affiliate links. Media Medusa earns a small commission when you purchase through those links. Cat Grant (Calista Flockhart) might be the obvious choice. Cat owns a multi-media conglomerate and vows to get the first in-person interview with Supergirl! But who keeps turning up on the TV in the background during scenes? An intrepid reporter for a metropolitan local TV station who seems to be on top of all the Supergirl news! Maybe that guy will get the first Supergirl interview. But who is this young go-getter? Supergirl is a show about taking a chance by moving up to the big leagues, like Kara branding herself after the greatest hero of all time (hint: Superman); James Olsen (Mehcad Brooks), quitting The Daily Planet to make a name for himself outside of being Superman’s pal; even some of the villains have ambition. 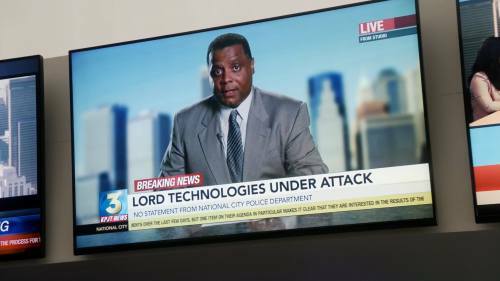 But eagle-eyed Supergirl viewers have probably all noticed that the unnamed newsman frequently reporting on Supergirl is none other than Pawnee’s own Perd Hapley, who has given himself a chance to grow, by pulling up stakes from Indiana and moving to National City for a larger audience than Pawnee ever allowed. Good for you, Perd! I hope you get that interview with Supergirl! That’s right, Perd Hapley (Jay Jackson) from Parks and Recreation has crossed over into Supergirl! Perd was always one of my favorite characters, the newsman and frequent host who could say nothing with a lot of words. “This is where the controversy of this story gets even more controversial.” I can’t wait to hear Perd’s thoughts on Supergirl! Editor’s note: Apparently Jay Jackson also showed up as a newsreader on Revenge, Pretty Little Liars, Battleship, Scandal, Dexter and The Mentalist! Thanks for reading! What’s your favorite Perd Hapley scene? Tell me in the comments!